Presidential City, one of Philadelphia’s most prestigious 20th century landmarks, epitomizes the vision of crafting a world-class living experience. Creatively reimagined to accommodate the lifestyles of urban-paced commuters and community-minded residents, the high-rise complex invites an identity of cosmopolitan sophistication and stately elegance. Presidential City, Philadelphia’s first skyrise community, was constructed in 1950 by John McShain, world-renowned builder of the Pentagon and Jefferson Memorial, and stands as a landmark to the height of the city’s 20th Century boom. With panoramic views of downtown and Fairmont Park, each apartment tower carries a unique feel of elegance and artistic curation. Setting a new age standard of intraurban living, Presidential City offers both a neighborhood atmosphere and sleek exclusivity from any vantage with the convenience of Philadelphia as your backyard. The Washington Building offers an innovative blend of timeless sophistication and modern amenities for convenient city living. Inspired by the finest five-star hotels, Presidential City’s Washington Building is rich with upscale touches that embody contemporary urban class. The Adams Building features a contemporary boutique theme with high-end amenities and a Parisian-inspired lobby. This refreshing and inviting space is drenched in colors and offers convenient upscale living in one of the city’s most sought after areas. Residents can relax in our playful Parisian themed lobby, or the Parisian whimsy inspired Family Room. Take advantage of our premier amenities with around the clock front desk services and our family-friendly library and children’s play center. The carefully curated, Soho boutique inspired Jefferson Building seamlessly balances old world charm with fearless modern trends. The jewel box apartments are appointed with premium appliances and high-end finishes designed to maximize space and functionality. The effortlessly cool Madison Building has an urban hipster vibe with its sleek interior design. Featuring avant-garde artwork and custom industrial lighting, these Brooklyn-chic inspired building exudes a youthful, urban aesthetic. Each apartment features spacious sun-soaked rooms, deluxe-sized closets with customizable storage options, as well as premium appliances and decorative accents. Experience extraordinary lavishness in the pinnacle of Presidential City’s residences, the Penthouses. Here, the vision of urban sophistication and exclusive opulence come together with floor-to-ceiling windows that bathe the rooms in natural light, capturing the full panorama of Center City and outer Philadelphia. With ultra-sized bedrooms, dressing rooms, living areas, and custom storage, the Penthouses epitomize urban grandeur. Designed to embody the portrait of contemporary urban class and stylish custom-fit living spaces, Presidential City’s apartment options are creatively designed to provide residents with both palatial living and comfort. Each apartment features spacious sun-soaked living and dining areas, deluxe-sized closets with customizable storage options, as well as premium appliances and decorative accents. Each bathroom is ecofriendly and ergonomically designed to create a profile of relaxation and ease. Set among Italian porcelain tiling and ambient halogen-style overhead lighting, features such as the ultra-deep soaking tub, dual-flush elongated toilets, and ultramodern amenities create a lavish aesthetic. Showers are thermostatically controlled, and feature rain-style heads and spray and body jets. Wash areas include integrated makeup lighting, a hanging Italian-style double vanity, and the unique feature of conveniently placed power outlets. Including the latest Euro-inspired fixtures and finishes, bathrooms are shaped to become an accent to any living space. Presidential City kitchens are fashioned with spacious layouts and gourmet-inspired themes. Featuring complementary color and texture options, each space is accented with antimicrobial quartz countertops, wood grained drawer spaces, and high gloss cabinetry. With premium integrated stainless steel appliances and unique features such as a glass tile backsplash and a movable island, prep and cooking areas are crafted to create a highly customizable in-home culinary and dining experience. Lined with custom fit high-efficiency tilt-and-turn European windows and stylish roller shades, Presidential City apartments provide residents with a natural, relaxed atmosphere. Each room features recessed LED overhead lighting, ceiling fans, and eco-efficient carbon-free electric heating and cooling systems to allow maximum comfort customization in each living area. Accented by quartz windowsills, energy star appliances, including a front-load washer and dryer set, and exotic sustainable Sapele hardwood flooring, apartments provide an ecofriendly environment artistically crafted to accommodate residents’ ideal preferences. All facets of Presidential City’s buildings and apartments are eco-efficiently designed and environmentally friendly. They include new high-efficiency building envelopes and insulation, as well as reflective, thermally insulated roofs. Each apartment features newly-installed windows filled with argon gas and heat-blocking coatings, carbon free heating and cooling systems, 100% energy star appliances, LED lightbulbs throughout, and water-efficient dishwashers, washing machines, and toilets. Additionally, Presidential City utilizes rainwater retention systems, and purchases all electrical energy from wind-powered generators, making it a fully carbon emission–free property. Through these energy-saving renovations, Presidential City saves 50 million pounds of CO2 emissions per year. More than a recreation area, Presidential City’s Sora Pool Club provides residents with a sophisticated Asian-inspired getaway. Featuring three temperature-controlled pools, waterside cabanas, and a rooftop lounge, the pool club offers residents year-round resort-like access. Including an Olympic-length lap pool, lounge pool, and activity pool, water areas are tuned to match residents’ moods and lifestyles. With massage, personal care, and holistic treatment spa services, a dry sauna, coed steam room, as well as tanning booths, Sora offers both wellness and relaxation. Designed to promote and serve active lifestyles, Presidential City’s gym and wellness center includes state-of-the-art equipment, a juice bar, and numerous exercise options. With specialized cardio, weight, boxing, biking, and stretching equipment, the fitness center is tailored to each individual’s needs, and provides residents with free PostFit cardio, Pilates, yoga, cross-fit, and spin classes, as well as the option for private training sessions. Relax at Presidential City’s world class spa. Choose from an array of services in an ambiance that engages the senses, calms the mind and lifts the spirit. Enjoy a relaxing massage or a skin treatment and let your worries melt away. You’ll leave our spa feeling rejuvenated and refreshed. To complement the fitness center and Sora pool club, Presidential City features inviting activity areas to promote community and provide residents with season-round recreation. With multiple dog parks and daycare services, full-size basketball courts, and yoga and Zen gardens, the concept of a backyard is reinvented for urban living. Featuring a world-class outdoor kitchen area equipped with Fire Magic grills, refrigerators, and comfortable dining spaces, residents receive a personalized neighborhood for hosting friends and outdoor entertainment. As a full service residence, Presidential City offers a variety of additional amenities. Parking is never an issue with our onsite garage. When you don’t have time to get to our Fitness Center, take advantage of one of our convenient satellite gyms. Our lounges are available for all of your business needs. We’ve incorporated conference rooms and efficient co-working spaces with Wi-Fi and printers to bring you the benefits of an office without the commute. Lounges are conveniently located in each building. We even have space for your furry friends; enjoy our dog parks for some exercise or a game of fetch. And when you just need to relax, you’re always invited to enjoy a complimentary cup of coffee or join us for a movie. 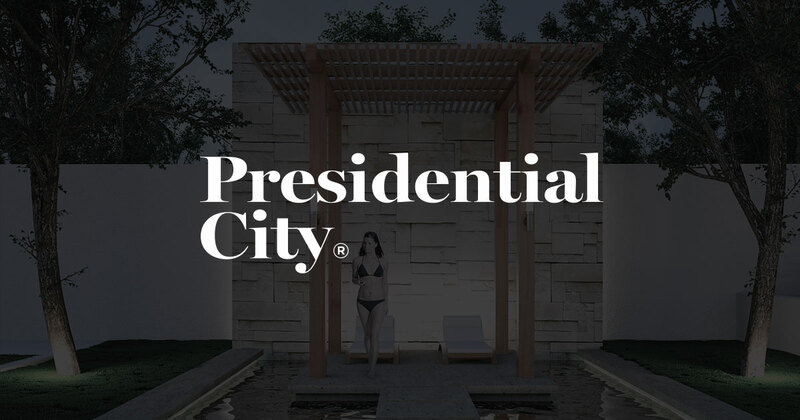 Situated among numerous amenities and a growing commercial industry of financial, communication, law, and digital firms, Presidential City offers a desirable location in a burgeoning cultural and economic district. Centrally located on City Avenue with direct access to I-76 and Route 1, Presidential City is ideal for commuters. With grocery centers, shopping outlets, and boutique dining, the neighborhood carries a variety of perks tailored to residents’ tastes and needs. Adjacent to scenic Fairmount Park, Presidential City offers additional everyday access to one of the nation’s paramount outdoor reserves. ThinkGreen Design LLC specializes in multi-unit residential community development and resort-style property and landscape design. They have extensive experience designing and developing exterior living spaces that complement adjacent architecture and natural surroundings to create areas for people seeking both an atmosphere of relaxation and socializing. Dedicated to the vision of their clients, they continue to execute and deliver award-winning projects on schedule, on budget, and in a lasting style of excellence. SgRA is a full-service professional architecture firm dedicated to serving clients from property pre-design processes through construction administration. With expertise in architectural services, building design, zoning and governmental approval processes, complex building code analysis, historical restoration and tax credit applications, interior design, construction documentation, and construction administration, they deliver full-scope excellence to ensure all facets of their projects succeed. Sergio Coscia and David Moos founded Coscia Moos Architecture in 2010 with the firm belief that architecture can be creatively challenging, sometimes frustrating, but always enjoyable. Over the past five years, they have worked on a variety of projects ranging from abandoned factories to ultramodern high-rises. With a simple beginning that started with one project spread over a single desk, Coscia Moos Architecture has since expanded the talent, diversity, and expertise of their team to ensure clients’ visions are fulfilled through creative and imaginative problem solving. Olaya Studio is a design firm headquartered in Philadelphia since 2006. Their geographic and cultural backgrounds, coupled with an intimate knowledge of the region, give a unique perspective for creating urban, architectural, and interior designs that are both unabashedly contemporary and deeply rooted in their context. They provide a full range of design services to commercial, university, and institutional clients in the Mid-Atlantic region, and are as diverse and unique as their wide range of clients and project types. Creative Soldier is an award-winning creative agency and industry leader recognized for creating impactful campaigns that resonate and visionary results that prosper. We transform the world’s most innovative residential and commercial real estate developments into globally recognized brands. As an agency, we’ve built lasting relationships with our clients, which include Extell, Post Brothers Apartments, The Kushner Companies, RFR, Invesco, Two Trees, The Trump Organization, Property Markets Group, and International Sales Group.